Karina's Kreations: Dryer Sheet Technique! I tried a new technique the other day. It's called the dryer sheet technique and looks very sparkly up close. You need to do a load of laundry and use a bounce sheet in the Dryer. I actually used three so I could play a bit. I stamped the trees from Patterned Pines stamp set in Not Quite Navy ink on Whisper White card stock. I took this outside and sprayed on some spray adhesive. Make sure you lay your card stock on card board. The spray adhesive it really sticky! Quickly lay a cut piece of used bounce over your card stock and smooth out the wrinkles. Sprinkle on Dazzling Diamonds glitter over top. 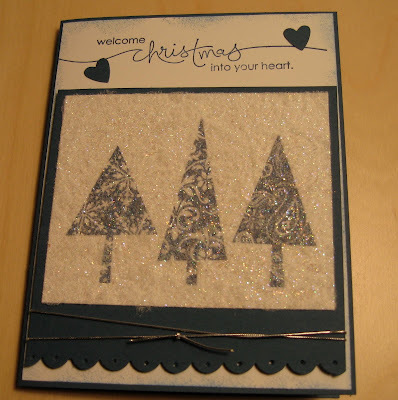 Shake the excess glitter off your card and trim the edges of the bounce sheet. The result is so sparkly but it's hard to see from the picture.